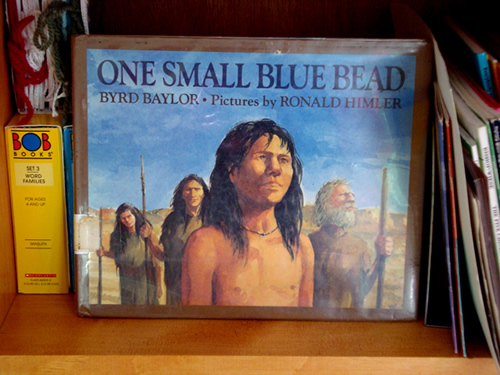 One Small Blue Bead is a lovely story that peers into the life of nomads in ancient times. Kamikaze was immediately intrigued by the subtle illustrations and the poetry of the prose. We got this book from the library and now I want to own it. The story opens with describing the location of an artifact, a small turquoise bead, and then gives an explanation as to how it ended up where it is today. The main character, named Boy, offers to do the daily chores for an old man who wants to wander and see if he can find other people like them. Boy does this because he too is curious if there are other people like him. Finally after months of working diligently on his and the old man’s chores, the old man returns with a companion- a boy who hands Boy a small blue bead as a gift. The visitor tells the tribe of all the things he’s seen and travels with them as they search for new lands to settle in. This book is a lovely way of introducing to a child what nomad life was like in ancient times, such as how they lived and what types of concerns nomads might have had as well as how contact between different tribes may have occurred. I found this book to be a perfect supplement to discussing nomads. There was actually one verse which almost made me tear up. Who know that they have brothers. Byrd Baylor nailed it with this one. I’m definitely going to check for more of his work. One Response to "Children’s Book Review: One Small Blue Bead"
I am impressed with your book review site. I am going to use your review on “One Small Blue Bead” in an article “Beads to Kids – the Montessori way.” And give you a link. My website Bead-z-mommys-business is for jewelry artist work -at -home -moms ( dads and grand parents too) who also take care of young children. I have not posted this article yet, but do visit in a couple of days. Thanks again. Dita.